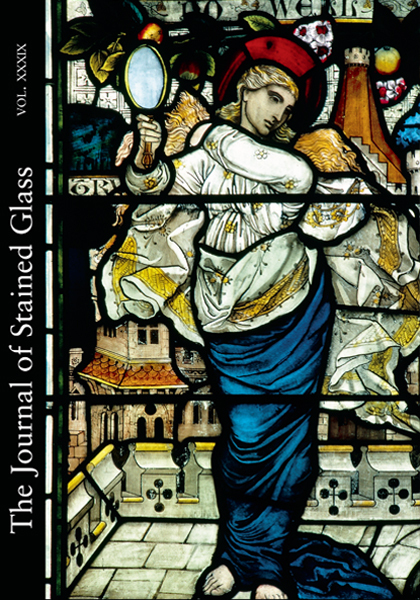 Guest Editorial by Dr Simon Bradley on stained glass in Pevsner’s Buildings of England series. In-depth studies of Henry Holiday’s important scheme for a New York hospital and work by H. J. Burrow and George Parlby for Powells & Sons, as well as biographical data on the Burrow family. Contemporary practice covers the rewards of creating glass and mosaic in children’s schools, the powerful work of Israeli artist Ardyn Halter, New Work Portfolio by Members & Associates, and annual prizes in the UK. Also features the origins of transfer printing on glass with its use of stained glass imagery and the challenges of its restoration. Concludes with a review of Australian exhibition on the stained glass of William Bustard, 9 book reviews and 3 obituaries.